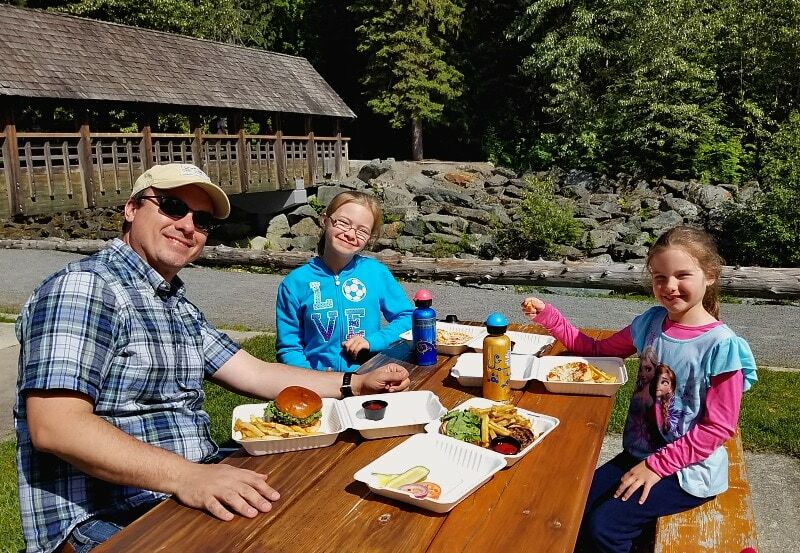 Whistler BC Restaurants – 5 Family Friendly Restaurants + Ways to Save More on Food! 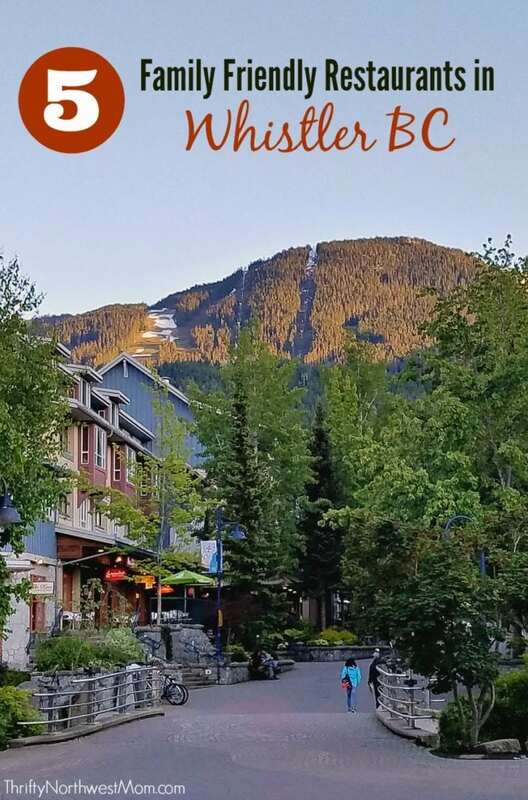 We had the opportunity to head to Whistler at the end of May for our first visit to this area and one thing I had heard so much about Whistler was that it was a foodie lover’s dream with all the delicious restaurants to try. And let me tell you, Whistler definitely did not disappoint and there are so many more restaurants on my list to try out on our next visit there. Whistler is filled with such a wide variety of cuisines for every palate and the main focus in Whistler is providing locally sourced, organic ingredients whenever possible, which is not only healthier but makes the food taste so much fresher. We also saw a number of restaurants offering gluten-free and vegan meals as well to cater to those with special diets. I love that there is such a wide variety of restaurants to try in this area. For those of you coming from the Northwest & US, with the weak Canadian dollar, it makes for some fantastic prices on food at these restaurants too. A bummer for those in Canada, but it makes it the ideal time to visit Whistler if you’re in the NW. You can fit more dining out in your budget with the lower prices, so more opportunities to try out the wide variety of restaurants available at Whistler. Make sure to check out all of our tips & suggestions on visiting Whistler BC with your family during the spring, summer or fall seasons. Here are our best suggestions for family-friendly restaurants in Whistler BC. I’ve also shared a few more restaurants to check out, as well as ways to save even more on dining when you’re visiting Whistler. Creekbread is a definite must-try restaurant when you’re in Whistler for all of you pizza lovers. It’s very family friendly – in fact, when you enter the restaurant, they give the kids paper & crayons, so they can design menu covers for the restaurant. Kids can make as many as they want while they wait and then hand them to the waiter to use as the front & back covers for menus for the restaurant. So, each menu is personalized by the kids who have eaten at the restaurant, which has such a charming touch, I think. 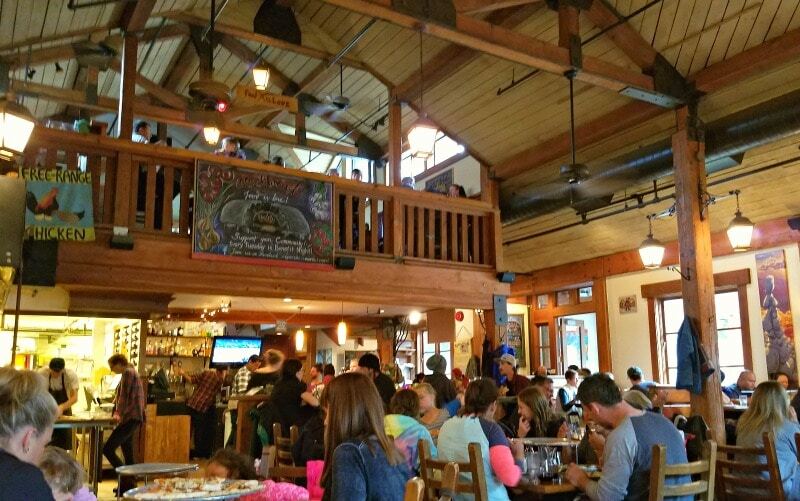 Creekbread also has a festive atmosphere in the restaurant and we saw numerous families with kids of all ages, so you won’t have to worry about bringing young children and babies in this fun atmosphere. What I loved when I walked in is that they list the local farms where they get their produce, free range chicken, nitrate-free meats & more, so you know you are getting locally-sourced and organic ingredients whenever possible. The pizza is all cooked in large wood-fired ovens which you can watch from the restaurant. I love that it teaches kids about where the food comes from and they can watch the pizza cook as well. The best part of course is the food – the pizza tastes amazing, with a variety of cheeses, sauces and toppings. They will even let you split toppings on a pizza half & half, so you can try more options that way. Creekbread is located in the family-friendly village of Creekside, just about 5 minutes away from the main Whistler Village and right off the highway. Pasta Lupino is a quaint little Italian restaurant that is casual, cozy and easy to access, whether you’re staying right in Whistler Village or a surrounding area like Creekside. This restaurant gets 4 1/2 stars on Trip Advisor and we all thoroughly enjoyed our authentic Italian dishes. They offer fresh made pasta, sauces, and bread and the freshness of the food can’t be beat! We were exhausted after a busy day of exploring Whistler and we were excited to find out that Pasta Lupino also offers takeout. My husband and I love going out to new restaurants, but after a busy weekend of outdoor exploration with our kids, nothing sounded better than heading back to the hotel & eating dinner where we could relax and unwind. We didn’t have to wait for seating but instead could run and grab the car from the parking lot & were back just in time to pick up our order. A bonus was that many of the items on the take-out menu were quite a bit less than the regular menu prices (they did not include salad, which you could order separately, and only 1 slice of bread per entree compared to the bread basket). For example, I ordered meat lasagna which was $17 (Canadian prices) in the restaurant (comes with salad & bread), but only $10.95 for takeout. I still received a generous helping plus a slice of bread for just $10.95 Canadian, which is about $8.50 US. Now that is a fantastic price for some delicious food if you do prefer to do takeout. Another great option for takeout is Peaked Pies (across the street from Pasta Lupino on Main Street). They do have a small area of seating in the restaurant & outdoors as well. 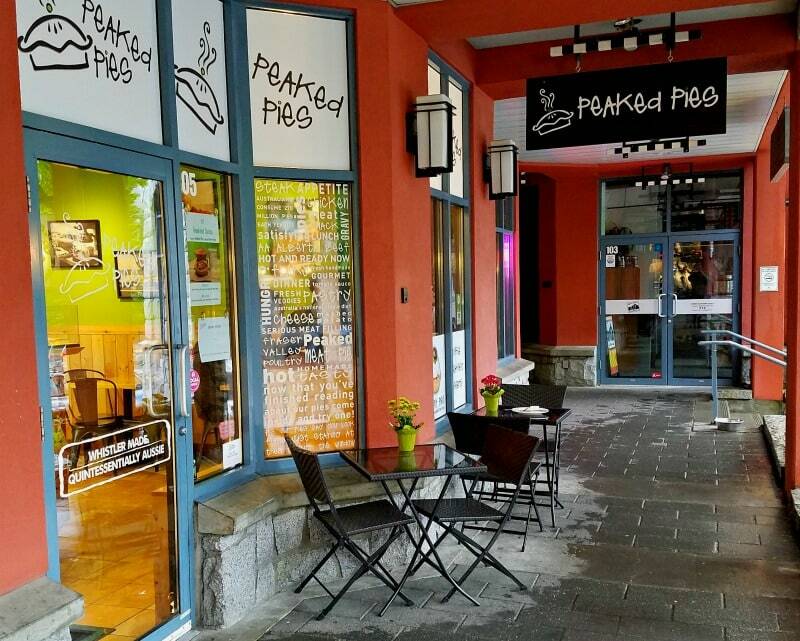 Peaked Pies offers a variety of Australian meat pies, which are really the perfect size for kids. It’s a chance for the family to try out a new cuisine that you may not have tried before at reasonable prices. Prices range from $6.95 – $7.95 (around $5.50 – $6) for for the meat pies. Pick out a few varieties for the family to try and put them all in the middle of the table to try. We did not try their meat pies, but did pick up their dessert pies and cinnamon roll (Apple Crumble & Mixed Berry) and it was a delicious dessert after dinner one night. Another restaurant located right on Main Street, Crepe Montagne is an authentic French creperie. I am slightly biased as crepes are my favorite food, but I was excited to see that Whistler offers one & it gets rave reviews as well. The only downside is that they were only open till 2:30 or 3pm each day (this was spring time only which was their slow season – it looks like they are now open till 9pm). This meant that we did not have a chance to try it out (the wait times were too high on Saturday when we headed there), but it is definitely on my list to try when we go back to Whistler. The dinner menu includes meat & cheese fondue in addition to crepes as well. They do offer takeout and even delivery thru WhistlerDineIn.com – now this would be perfect if you’re in a suite or condo with tables to have your breakfast without leaving your hotel. We love the Old Spaghetti Factory as you know what to expect at any of the locations, the food is always a hit with families and they offer reasonable prices for a family meal with generous portions. We wanted to try out some new restaurants, so we didn’t check out the Old Spaghetti Factory in Whistler on this trip, but I was thankful to have that option of a tried & true favorite that I knew my kids would love and always has a fun atmosphere where any family would feel right at home. I wanted to add the Elements Tapas restaurant on as a must-try restaurant for breakfast. I wouldn’t say it’s the most family-friendly as they only offer a few, select items for kids with the smaller portions, although my girls enjoyed their French Toast & it was reasonable prices ($6 CA which is less than $5 US). It also was a long wait on the weekends – we waited about 45 minutes. However, there is a fun toy store just a few shops down which made the wait time go by fast for our girls as they had given us a general time to be back. The wait time was well worth it, though, once we tried the food at Elements! One of the best breakfasts I’ve had in a long time where you’re disappointed when the food is all gone. One of my husband’s favorite breakfast foods is Eggs Benedict and he definitely agreed that this was one of the best he’s tried. I tried an Aged Cheddar & Crispy Bacon French Toast style with maple cider glaze frittata and it is just pure deliciousness! It also comes with their signature potato tartlet with chive sour cream – I wish I knew how to make this at home – amazing! 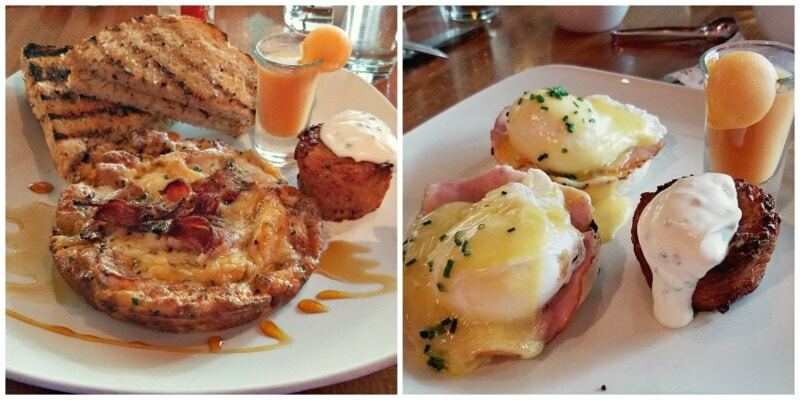 We found this restaurant thanks to the rave reviews online and we will definitely be making a return trip for breakfast on our next Whistler visit. We loved that the prices were quite reasonable, too, with most entrees between $8- $10 US. You won’t be disappointed with a visit to Elements for breakfast, even if you do have to wait for a bit. The Aura restaurant at Nita Lake Lodge in Creekside is another restaurant that I think is definitely worth a visit due to the serene lake views you will have as you eat. Nita Lake Lodge is a beautiful hotel right on picturesque Nita Lake, which is just a few minutes away from the Creekside Village, yet it’s so peaceful & serene situated on the lake. The breakfast there was delicious, as they use locally sourced ingredients as much as possible, so the food is very fresh & tasty. They do offer a brunch till 2pm on Sundays as well, so that’s an option if you’re looking for a later breakfast. If you want a kid-friendlier option, I’d opt to eat out on the patio during the summertime. When you’re on a vacation with kids, one of my best tips is to stay at a hotel or resort where you will have access to a small kitchen, whether it be in a suite, vacation rental, condo, etc. If you can’t find that, at least try to make sure your hotel will have a refrigerator and microwave. Staying at a location with a small kitchen may cost more initially, but when you factor in being able to eat as many meals as you want in your hotel/resort instead of eating out for every meal, it could work out to be a better deal for you. We stayed in a suite at the Legends Creekside Resort in Whistler (they have awesome suites – more to come when I share about places to stay) and we definitely took advantage of having the kitchen for a few meals. We love trying out new restaurants, but it does help to save costs by eating a few meals in your room. It’s also so nice when your kids get up super early on vacation (why do kids always do this? :) ) and you can get them breakfast to tide them over until you’re up and ready to start the day. Having a kitchen was so handy when we ordered takeout and brought it back to the hotel to eat after a long day of adventures outside. Our hotel at Legends Creekside Resort not only had a great kitchen, but also had a full dining table so we could all have our takeout dinner together at the table. We also love to pack lunches or healthy snacks if we’re headed out for a day of hiking or bike riding, so that we don’t end up buying junk food if we get hungry, but can keep a small cooler in the car to keep our snacks & drinks cool while we’re out and about. 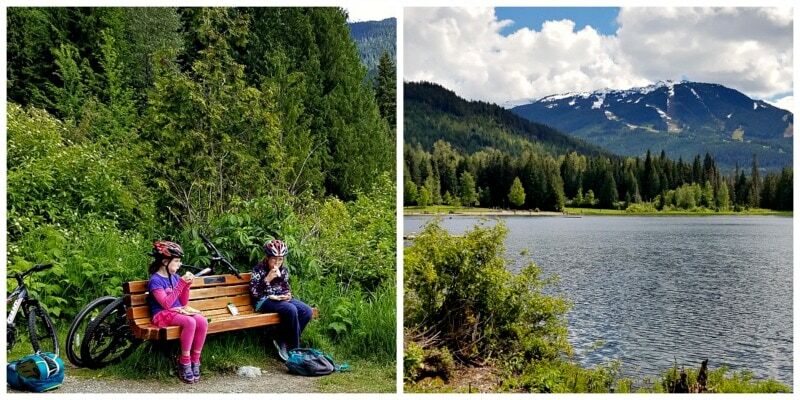 Whistler in the warmer seasons (spring, summer & fall) has so many places that are so perfect for a picnic lunch so this is a great way to experience the beauty of Whistler by spending time outside with a picnic lunch. As I mentioned, this is why we love to stay at locations with a kitchen, so you can pack items for a picnic lunch, especially if you’re going to be on the go the whole day or out exploring and don’t want to break to go in to town to eat. It’s also quite frugal to pick up some bread & sandwich fixings, fruit & veggies for lunch. When we were at Whistler, we had brought some sandwiches with us to eat on our afternoon bike ride, but then we discovered the Farmer’s Market before we picked up our bikes. 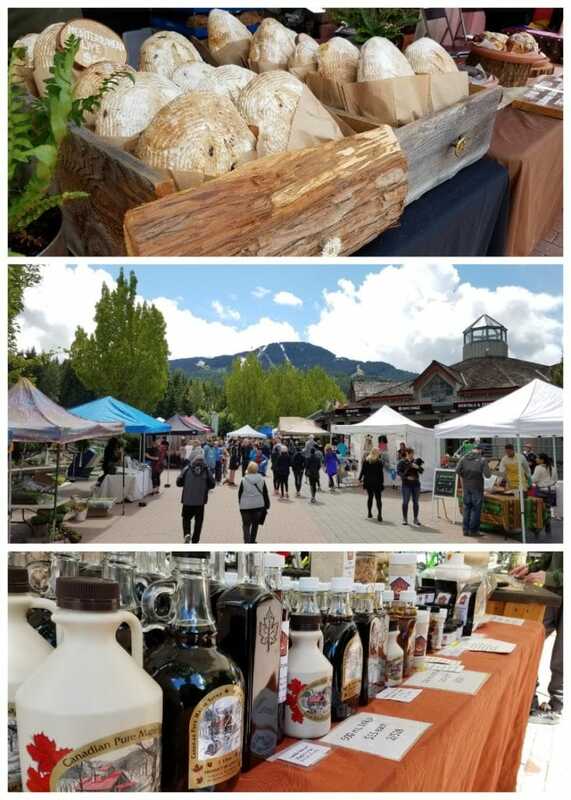 Oh my, the Whistler Farmer’s Market was filled with amazing goodies – beautiful crafts from the artisans, fresh baked loaves of bread, organic produce, maple syrup (my husband stocked up on his favorite kind of syrup as prices are better here than the US) and delicious food trucks! So much good food that my husband and I had to forego our sandwiches to try some of these delicious foods from a variety of ethnicities (we tried Pierogies & Empanadas – yum!). It looks like they have over 60 vendors now through the summertime. We sampled a few of the foods as we walked around & then packed the rest up in our backpacks to eat while sitting next to the beautiful Lost Lake in the middle of our bike ride. We found that the takeout prices for some restaurants were sometimes half the cost of the menu prices, as I mentioned when we headed to Pasta Lupino (& found this with several other locations as well). This was a way you could save on lunch or dinner costs by getting takeout and eating it at one of the many pretty locations around Whistler or bringing it back to your hotel. Plus, the convenience of ordering the food to go while waiting with the kids in the car at the end of a long day & then eating back in your suite was so nice as we were able to get dinner in 30 minutes or less when the wait times for the restaurant we wanted to go to was at least 30 minutes just to sit down. This was a nice option when we had played hard all day & the kids were tired & cranky & just ready to head back to relax while we ate. Whistler definitely offers a variety of savings when you visit during a slower season. The spring or the fall, especially, are such ideal times to visit as you can still take advantage of the majority of the outdoor activities (with the exception of swimming in lakes, etc), but you’ll find that many restaurants are offering different discounts. We found several restaurants offering either Kids Eat Free meals or 40% off your entire meal during the time we were there at the end of May. 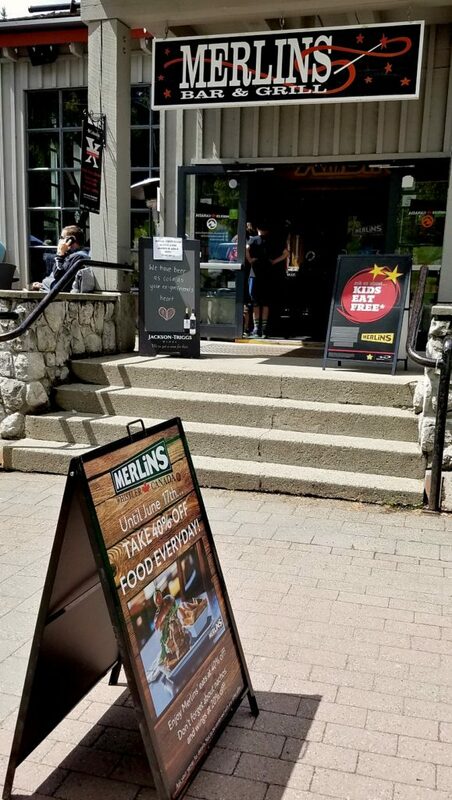 Merlin’s Bar & Grill was a restaurant at the base of the Blackcomb Mountain chairlift, which offered Kids Eat Free or 40% off your meal through mid June (we were there end of May). On our last day, we took the Blackcomb chairlift down from the Peak to Peak gondola and ended up right in front of Merlins, such a central location, and we got takeout burgers and pizza for the kids. We brought our food to a picnic table right next to the creek that runs through Whistler so we could listen to the rushing creek while enjoying our food. Another option for savings is Indulge at Whistler, which takes place every May. Indulge is a month long option for savings at restaurants, lodging, activities & more. There are a variety of restaurants that participate and offer multi-course lunch & dinners starting at $19 Canadian & up, so an awesome way to try out a new restaurant. Lastly, we even found a restaurant that offers all of their food for just $4.95/ea. It’s called El Furniture Warehouse and you can find appetizers, salads, and even entrees for just $4.95/ea if you’re really looking to save. You can read about it Trip Advisor to see what to expect. What are your favorite restaurants at Whistler? Great post and info! I was raised in Vancouver and its crazy…I have never been to whistler, is that crazy or what!?! I am hoping to get there this summer, I go back home often but always have friends to visit and then end up other places! Have a great Wed, your blog is fab!! I love this bakery called purebread. They have so many pastries it’s hard to pick a favorite. Oh we’ll have to check it out next time we go. I love finding new bakeries! Whistler is on my list of places to check out, so I’ll definitely be coming back to this post when I’m finalizing the details! I hope it’s helpful for you – you’ll love Whistler! Great recap!!! We also love The Green Moustache (Vegan) & Basalt for date night! !